If you’re drawn to emphatic verticals and horizontals, Mission satisfies a longing for order, dependability and authority like nothing else. Sturdy, solid oak construction is the norm for our Amish handcrafted Mission Bar Stool. Proudly made in the USA by Amish craftsmen! Comes with a 25 year warranty! 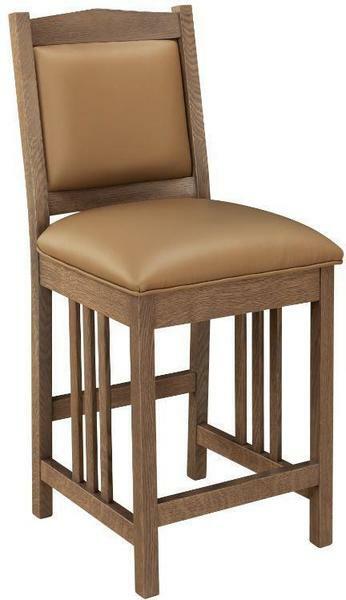 This solid wood bar stool is available with a variety of seat options and offered in two seat heights to accommodate your counter or table. These are handcrafted in the USA! The craftsmen of the Keystone Collection warrant their furniture to be free from defects in workmanship during the first 25 years. Seat Depth - 17 ¾"
Seat Height - 24 ¼"
Seat Height - 30 ½"